Chelsea maintained their pursuit of Manchester United in the Premiership title race with a hard-fought 1-0 win over Bolton at The Reebok. With The Red Devils bagging a comfortable success over Everton it was imperative for Jose Mourinho's side to stay three points behind the leaders. 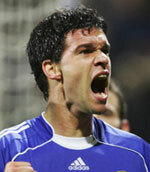 The contest was settled just before half-time with Michael Ballack's near-post header giving The Blues a lead they would not surrender en-route to the three points. The home side had the better of the early exchanges with Kevin Davies heading over Nicky Hunt's hopeful lob into the box while Carlo Cudicini had to be down quickly to gather El Hadji Diouf's cross. Chelsea slowly but surely began to stamp their authority on the contest with Jussi Jaaskelainen comfortably saving Frank Lampard's shot, before again denying the England international from a dead-ball situation. The visitors should have got their noses in front after 21 minutes, but after Ricardo Carvalho saw his back-post header rattle the upright Michael Essien sent a drive just over the crossbar. The sides then exchanged efforts with Geremi blazing a shot from distance well wide of Jaaskelainen with Diouf's corner shortly after forcing a fine save from under his bar by Cudicini. Just when it looked like things would end all square at half-time, Chelsea managed to get their noses in front through Germany international Ballack's close-range effort. Andrei Shevchenko was desperately unlucky to see his effort from distance parried out for a corner, but from the resulting set-piece Ballack got the better of Davies at the near post to nod home Lampard's cross. Bolton were inches from levelling matters shortly after half-time with Tal Ben Haim's long-range curler bouncing just wide of the visitors' far post. Mourinho's side hit back with Didier Drogba trying a left-footer while yet another long-range effort from Lampard - that looked destined for the net - was again saved by Jaaskelainen. Nicolas Anelka displayed his talent with a brace against Arsenal but it was not his night against The Blues and he failed to get a touch on Diouf's free-kick that surely would have resulted in a goal. Anelka was again involved shortly after although his header back across goal from Hunt's deep cross left Kevin Nolan too much to do in the middle to reach the ball. Diouf thought his left-footed strike from John Terry's poor clearance looked destined for the back of the net before Cudicini got a firm hand on the shot. The former Liverpool man had a half-chance of snatching a last-gasp leveller, but his back-heel deep into injury-time was pushed wide by the impressive Cudicini as Chelsea bagged the win.